​Since it’s conception in 2002, Dumb Ox Ministries has been dedicated to seeing and meeting the needs of people of all ages by offering experiences that are genuinely life-changing. 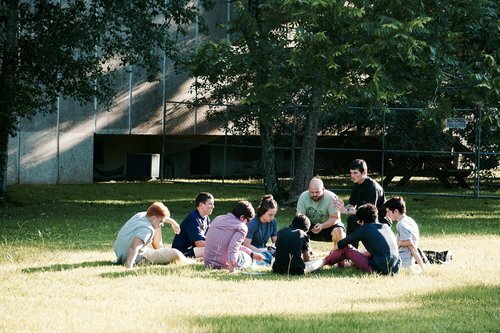 Through speaking events and retreats for teens, young adults, parishes, and organizations, we’ve ministered to tens of thousands people both locally and nationally, always with the intention of leading them to an authentic encounter with Jesus. We offer many options when it comes to themes, content, and activities including retreat packages that are tried and true, and retreat packages that are tailored to meet the needs of a specific community. With a large and experienced team of presenters to draw from, we’re confident that we can exceed your expectations for your next retreat! In addition to our experience leading retreats, we’ve spent the last three years honing our skills as parish mission presenters. We’re ready to come to your community with a compelling presentation of the Gospel that infuses the familiar three-day parish mission model with creative innovations. Relying on both engaging messages delivered through talks and inspiring experiences of original music and art, we offer a unique opportunity for the entire parish family to take steps forward together in their relationship with God and understanding of the Catholic Faith. We specialize in offering missions with a team of presenters capable of engaging the many segments of the congregation while also working closely with parish leaders to craft themes and content specific to the needs of the parish community and the particular Liturgical Season. What you are in love with, what seizes your imagination, will affect everything. It will decide what will get you out of bed in the morning, how you spend your evenings, what you do with your weekends, what you read, who you know, what breaks your heart, and what amazes you with joy and gratitude. Fall in love, stay in love, and it will decide everything. – Fr. Pedro Arrupe, S.J. One glance at the two of us standing next to each other reveals the obvious: we couldn’t be more opposite in so many ways – gracefulness, composure, and common sense paired with ruggedness, spontaneity, and impossible dreams. But in the collision of sweet and savory that is us, somehow there is comprised something deeply complimentary, something greater than the sum of its parts. This is true for both our personal relationship and the music we write and perform together. A second glance, or maybe a little more time in conversation with us, reveals something deeper than the differences: we share a profound reverence for one another, and this reverence is the reason we love, the reason we sacrifice, and the reason we sing. In 2012, Nine years after all the high school football games, plays, and proms were over, we finally became more than just high school sweethearts; we became husband and wife. We can say with all sincerity that marriage is on a daily basis the single most joyful and trying experience we’ve ever had. It’s beautiful. Since we were already a duo for life, forming our band Greg&Lizzy was a natural leap for us. Prior to performing together as a duo, we each spent years sharing our hearts and music as worship leaders across the US and internationally, and this is something we still love doing frequently. With the release of our first album To the Dust, it felt as though we’d accepted an invitation to a new collision of worlds, a new case of opposites attracting; that same feeling has only continued with the release of our latest album Now That I Have Love. It’s that beautiful place where the Sacred and the secular collide and become one and the same. This collision is, after all, our own story as we are broken, healed, and redeemed over the course of a lifetime. In many ways, we all live in the story of opposites attracting, and the attraction exists because we want wholeness, completion, unity…we want love. We want to be joined with someone, we want there to be only one of “us”, not two of “us”. So, as one simple man and one simple woman, joined together by one faithful God through one powerful promise, we want to share with you one simple story of love. It’s a true story and one we all have. It’s one that needs to be told more often. We hope for the impossible (which for one of us is totally practical;) …we hope our story and our music somehow floods your heart with peace, hope, joy, and longing, and somehow reminds you of the love for which your heart, mind, soul, and body has been created. This incomprehensible degree to which we are loved is what makes all of us human, and what makes us Greg&Lizzy. For more information about Greg&Lizzy and the good work that they are doing, please visit gregandlizzy.com. Click the booking button at the top of this page to get more info about bringing Greg&Lizzy to your parish, school, or event.